Portrait of a European, ca. 1590. V&A Museum. Jorge Flores will give a lecture on lesser known Portuguese texts on the Mughals on 15 November at the Center for Studies in Asian Cultures and Social Anthropology of the Austrian Academy of Sciences, in Vienna. 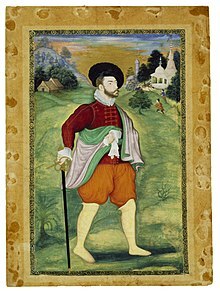 From the last decades of the 16th century onwards, the Mughal Empire became an object of observation of different Europeans who lived or traveled in South Asia. Independent travelers, VOC and EIC officials, Jesuit missionaries and Estado da Índia agents, all wrote extensively about Timurid India. Some of these texts were printed and widely known back in Europe, thus molding the Western image(s) of the empire founded by Babur in 1526. Names like Thomas Roe, Edward Terry, Francisco Pelsaert, François de La Boullaye-Le-Gouz or François Bernier are cases in point and immediately come to mind. The present lecture aims to considering less known texts, drawings and their authors, and to discussing their conditions of production and circulation. A set of interesting materials, often in manuscript form and mostly penned by Portuguese authors, which constitute the basis of the “Underground Mogor“. 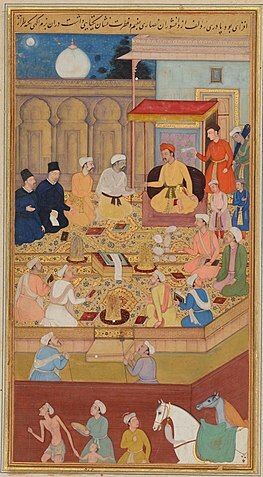 Mughal Emperor Akbar (r. 1556-1605) holds a religious assembly in the Ibadat Khana (House of Worship) in Fatehpur Sikri; the two men dressed in black are the Jesuit missionaries Rodolfo Acquaviva and Francisco Henriques. Gian Carlo Calza will be giving a lecture on Akbar and his religious nondiscrimination today at 18h at Palazzo Sciarra in Rome. [tracing] the history of one manuscript of the Shah-namah–one likely commissioned by the Timurid prince Muhammad Juki (d. 1447), which later entered the royal library of the Mughals in India. 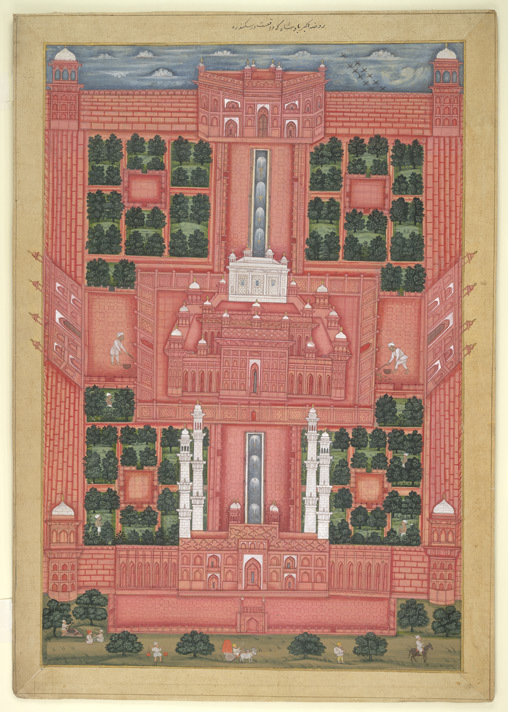 Gouache painting of the mausoleum of Akbar at Sikandra, by an anonymous artist working in the Rajasthan/Jaipur style, c. 1780-1800. Laura Parodi’s recent lecture at the Aga Khan Program for Islamic Architecture at Harvard University. Scroll to 2:10 for the start of her talk. Laura Parodi will be giving a much anticipated talk on Chahārbāghs, Palaces, and Mughal Court Routine in the Sixteenth Century on 19 April. 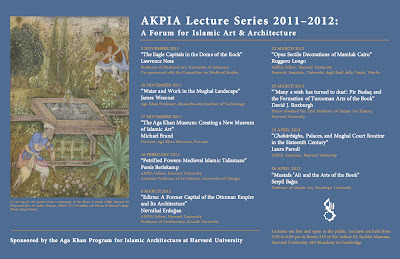 The event is part of the Aga Khan Program for Islamic Architecture (AKPIA) Lecture Series 2011-2012 at Harvard University. 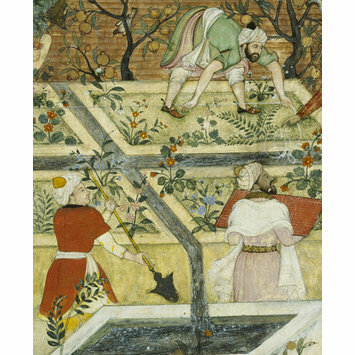 On Monday 19 March, Ebba Koch will be giving a talk on Mughal gardens and the Bagh-e Babur Garden in Kabul, at the Diplomatic Academy in Vienna. Is the subject of Allain de Botton’s talk at Gersham College, which also posts a variety of other interesting lectures across disciplines. There is a lovely quote from John Ruskin: ‘A good building must do two things,’ he says, ‘firstly, it must shelter us, and then secondly, it must also speak to us; speak to us of all the things that we think of as most important, and that we need to be reminded of on a day-to-day basis.’ In other words, architecture has a kind of memorial or communicative function. We want our churches to talk to us of churchy things, we want our libraries to communicate feelings of rest and concentrated study, etc. and we will be as upset by failures in those areas as we will be upset by a leaking roof.